Features: Spice up this summer season with these fun, colorful clip earrings. A super cool combination of golden hoops, green seeds and red shell bead and hand wrapped. Just the Perfect accessory to wear on a hot summer night or day with pinned-back hair, a loose pony tail and of course, super hot red lipstick. 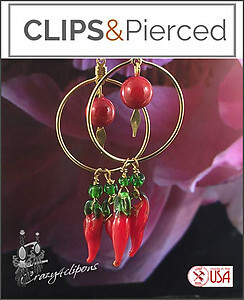 Specs: Golden Hoops, chili pepper charms, green seeds, red shell beads.